The Kagumoini coffee factory is belonging to the Kamacharia Farmers Cooperative Society. It is special to us as the farmers are very active, maximising their production by following trainings in Good Agricultural practices, with application of manure and inputs when required. The society is made up of smallholders growing mainly SL28, with a small amount of Batian and Ruiru 11 varieties. This area has two harvests, one from March to May, and main harvest season being from October to December. After pulping, the coffee is fermented overnight to break down the sugars, traveling through channels to the soaking tank the coffee is carefully cleaned, soaked and spread out on the raised drying tables. Time on the drying tables depends on climate, ambient temperature and total production volume undergoing processing. 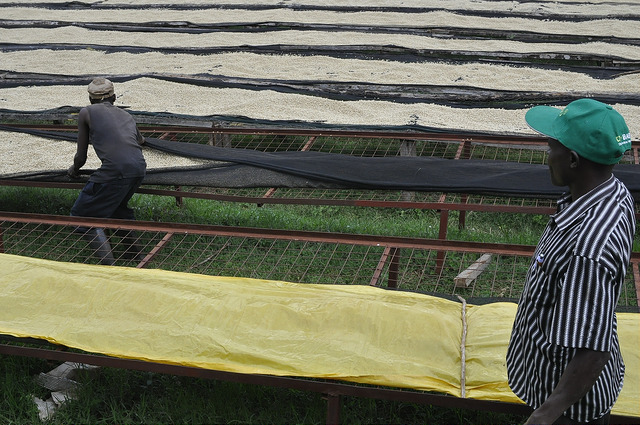 Continuous sorting and hand turning of the parchment will happen throughout the drying process. The factory is receiving assistance from our field partner Coffee Management Services (CMS). The long term goal is to increase coffee production through farmer training, ready access to inputs, Good Agricultural Practice seminars, and providing the most current printed materials on sustainable farming. The Society has undergone certifications wiht Rainforest Alliance and Cafe Practices. We strongly believe in establishing a transparent, trust based relationship with smallholder farmers, helping to support sustained industry growth throughout the country, and continuing to elevate the standards of quality coffee produced in Kenya.